Twentieth Century Fox Home Entertainment has just added the powerful drama A United Kingdom to its release roster, scheduling a Blu-Ray Disc and DVD version for release in June. David Oyelowo and Rosamund Pike star in this inspiring true story of the forbidden love between the king of Botswana and a white English woman in the 1940s. When they decided to marry just as apartheid was being introduced into South Africa, it caused an international uproar. But their passionate romance triumphed over every obstacle and changed the course of African history. Aside from the feature film itself, the release will also come with a few bonus features, such as a Making-Of Featurette, as well as a Featurette on the Filming in Botswana. Also included is the Featurette ”The Legacy of Seretse and Ruth” and Footage from the London Film Festival Opening Night Gala Premiere. 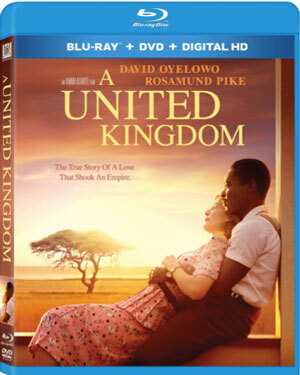 A United Kingdom will be in stores on June 6.